A large oval amethyst gemstone with an interesting twist, this custom cut gem has an exciting sleek look and the dimensions hold the secret. Handpicking one of the long chunks of rough amethyst that we had procured on our last trip to the mines, we went ahead and defied all dimension and proportion norms recommended for cut and polished gems. 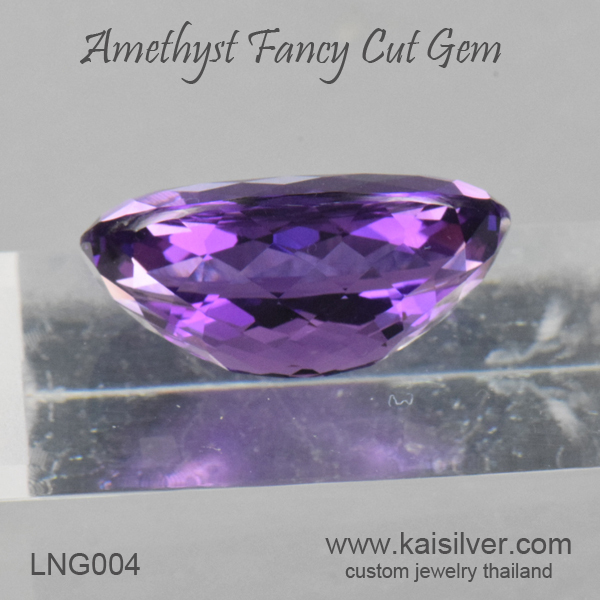 The oval amethyst gem measures 27x15mm and is cut with a depth of around 12mm. Despite the rather sleek shape, this amethyst boasts of a hefty 30 carat weight. If you are knowledgeable about gem mining and cutting, you would surely be impressed with the moderate price - a modest 975 U.S$. Gem artistry thrives on creativity, talent and many long years of practical experience. The amazing shape and size of the gem would look tremendous even when, set in the simplest of amethyst pendants or rings. But put it in the hands of a talented designer and you would end up with a spectacular jewel that, few other jewelry lovers could dream of owning. 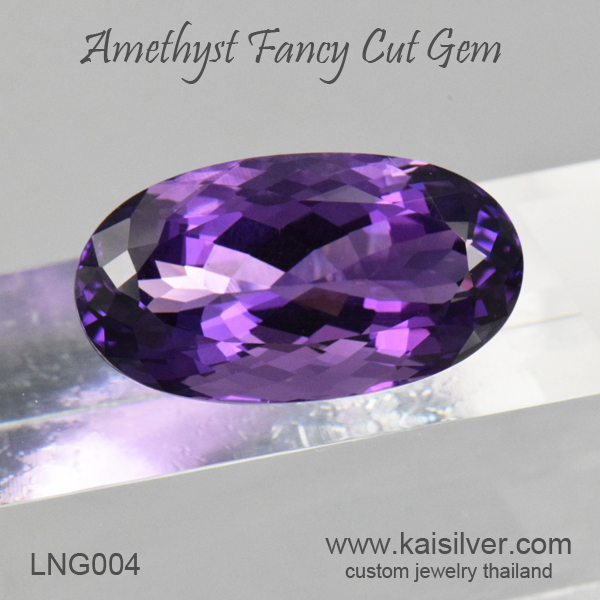 As the world's leading online custom made jewelry provider, we at Kaisilver can provide you with just the gem or with an outstanding jewel that showcases this large amethyst gemstone. You can choose one of our recommended designs or send us your own in the form of, a sketch or image. We craft both gold and 925 silver jewelry with the same quality standards. If you have any questions or requirements related to this large oval amethyst gemstone or any other gem, do contact our experts at sales@kaisilver.com . While we generally cut gemstones to adorn the fine custom jewelry that we craft in gold and 925 sterling silver, we might be able to accommodate special requests for unique gem shapes, sizes and cuts. We accept orders depending on the capacity available in our production line during that specific time. Gem artists working on unique shapes, cuts and sizes require substantial sizes of gemstone rough to begin with. It is for this reason that we recommend moderately priced gems for such unique gem cutting tasks. The most suitable gems for such gem cuttingwork are white topaz, citrine, blue topaz, white quartz, champagne quartz, lemon quartz and smoky quartz.